Do you dread picking up your luggage after a flight? It’s that airport nightmare. The flight has finally landed and you are at your destination. Your ride is waiting for you at the entrance and all that lies between you and your adventure is picking up your suitcase. That is not too difficult, right? However, as you make your way down to the baggage claim, the seconds start to add up. After nearly 45 wretched minutes, the bags are steadily coming out, and you have your eyes peeled for your suitcase. It is navy blue, right? Or maybe it was black. You quickly come to the realization that 98% of this flight also thought that a dark, average sized suitcase was the best choice. Before you know it, you find yourself lunging at every bag that remotely bears this resemblance. But then again, so is everyone else. Maybe you even snagged the wrong bag, only to be quickly chastised by a frazzled nearby traveler. 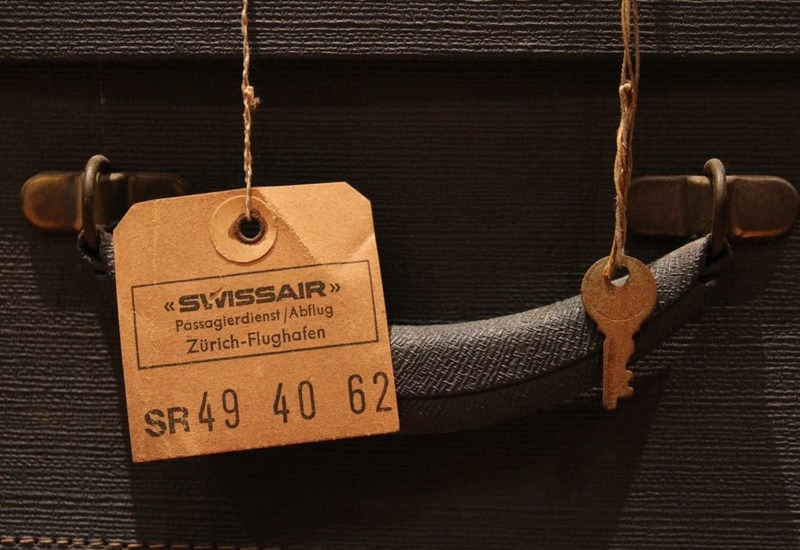 If this sounds vaguely familiar, you might want to consider personalized luggage tags. Let’s face it, a sure way to invoke travel anxiety is to be waiting at a luggage claim for a very plain looking suitcase. Most people don’t have their face on their bag, which isn’t a bad idea if you think about it. If you are looking for a more conspicuous way to differentiate between suitcases, personalized luggage tags are the perfect travel accessory. These small and practical tools give you a way to keep your personal information on your belongings. You can also add a splash of your own style to the bag. If you are looking for the best place to start buying personalized luggage tags, we have options. Check out these top selections from Amazon. Everything you need to know to make your luggage transportation easier. If you want a simple and sleek look, these tags are what you need. 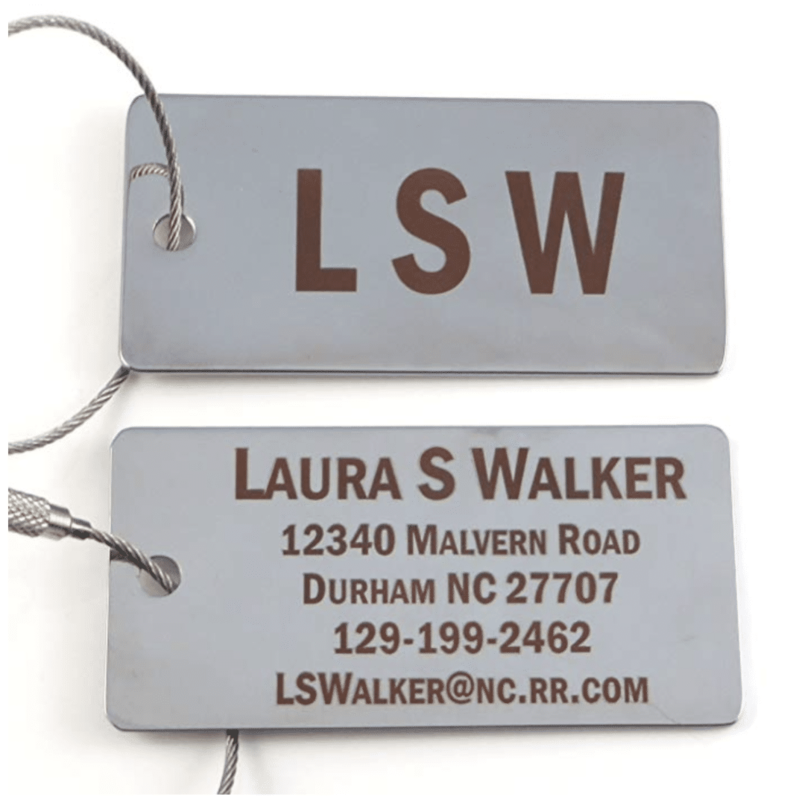 These customized silver or gold luggage tags keep your information right on hand. You can write your initials on the front and your personal details on the back. These tags are also extremely affordable, so you can purchase a few. Travelers like these particular tags because they are a great size, yet easy to view when searching for your bag. The luggage tags remain highly durable throughout your extensive travels; so don’t worry about the writing fading at all. 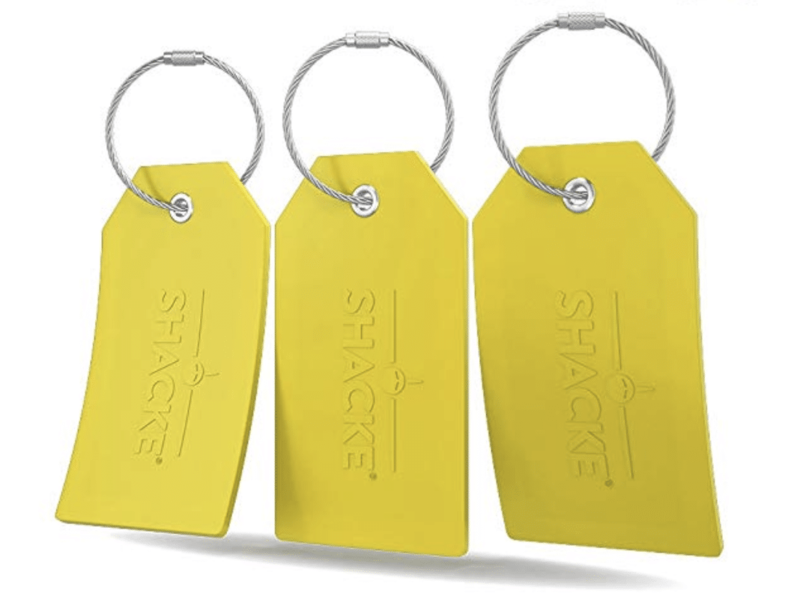 The Shacke Luggage Tags add a fun splash of color to any suitcase. Avoid that awkward neutral color clash when you have rubber, neon tags standing out on the baggage carousel. The steel loops keep the tags locked in through the hustle and bustle of traveling. Simply write your information inside the tag and rest assured that your bag is safe. 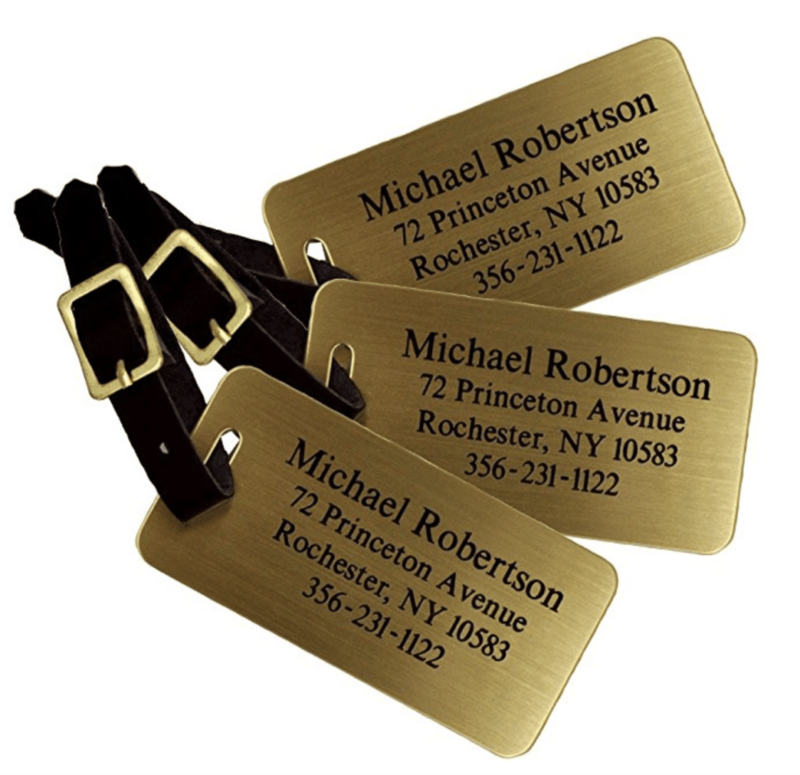 These custom brass luggage tags are a great accessory for business travelers. The no nonsense sleek appearance pairs perfectly with your formal suitcase and briefcase. You can purchase these specific brass luggage tags in a set of three, to use on each bag you bring. Another great feature of this particular brass tag is that the writing is sublimated. This means that the script will not fade over time. The text stands out boldly for easy visibility as you look for your suitcase. In life it’s not where you go, it’s who you travel with. We couldn’t have said it better ourselves. 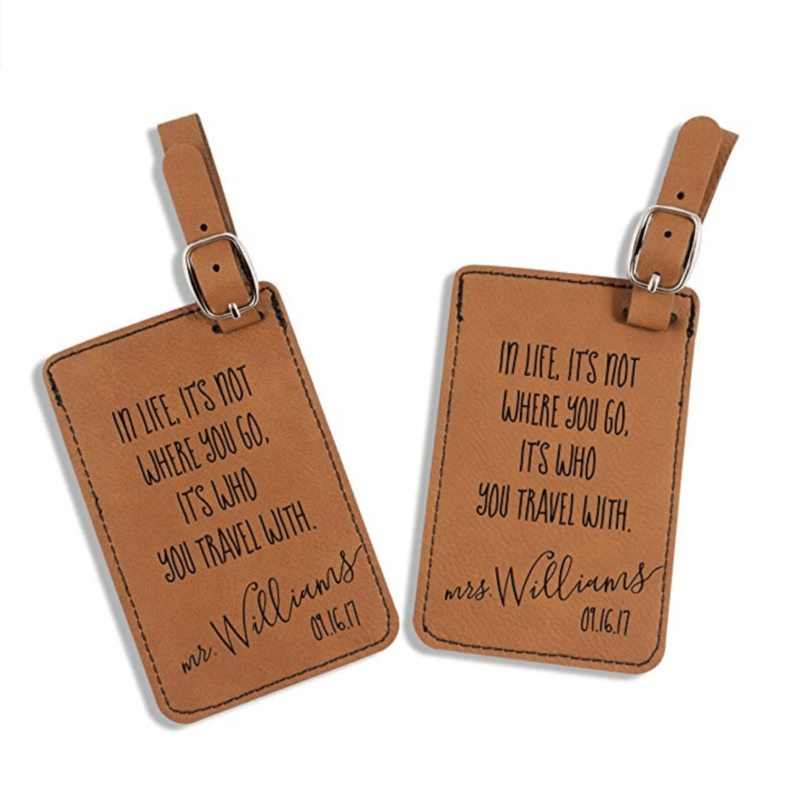 These adorable Mr. and Mrs. personalized luggage tags are ideal for a wedding gift for those traveling friends. Or you can even purchase it for you and your special person. Choose from the various shades of brown, depending on what matches your suitcase best. You can even personalize these tags even more by adding your wedding date to the script. Now that is what we call a save the date. Personalized luggage tags also make for a great gift. Personalized luggage tags are a practical accessory for every traveler. They also make for the perfect gift for that person in your life who is always on the go. You can’t really say no to something that is custom made for you. Personalized luggage tags ensure that you and those you love can keep track of your important belongings while traveling. Of course, the word personalized is quite literal. These tags come in every shape and size. You can likely find them in whatever style you prefer. There are wooden luggage tags for those who like earthy styles. If you have a great family picture, you can even add it to a luggage tag of your own. Either way, alleviate any stress that comes with picking up bags while traveling when you purchase your own personalized luggage tags.